I've reviewed a lot of classic ice cream bars over the years. Most fail to satisfy me, as I've turned into a snob, and these "ice cream novelties" and "frozen dairy desserts" just aren't exactly the quality level I've come to appreciate. But I found a winner. Klondike bars. I didn't eat many of these growing up. My family never had them. Our school ice cream program never had them. But I do remember liking them, although I rather suspected some of that was just the novelty of an item that came with a different wrapper style. But maybe that is why I was so excited when I tried one recently? They still are a bit of a unicorn to me, not a common item I encounter. Klondike bars have been around since the 1920's, and are named after the Klondike River. Their unique aspects are the fact that they do not have a stick, are square shaped, and have foil wrappers. Klondike makes their signature bars in a huge variety of flavors at this point: original (chocolate), dark chocolate, double chocolate, heath, mint chocolate chip, s'mores, cookie dough swirl, krunch, reese's, oreo, caramel pretzel, brownie fudge swirl, neo-politan, and more. Different flavors of ice cream, differing coatings, but all squares of ice cream coated in chocolate of some form. 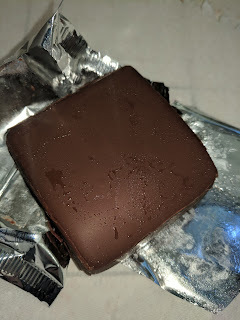 The company also makes "Kandy Bars", described as "Klondike meets candy bar", shaped more like a traditional candy bar, but, made of ice cream. And ice cream sandwiches, including Oreo ones (yes, with giant Oreo cookies and a ice cream filling with bits of oreo inside it (like what I tried in Canada, but made by Nestlé), and those made with Mrs. Fields Cookies. They also are the maker of ... choco tacos! 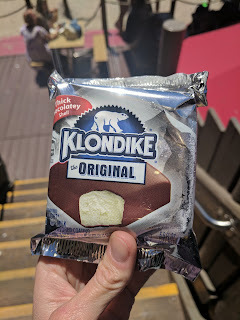 Most Klondike bars come wrapped in that signature foil wrapper, but, single serve ones come in a more standard plastic bag wrapper. I almost expected a foil wrapper inside, but, alas, nope. The single serve bars are also 20% bigger than the standard, 102 grams instead of 85 grams. The size threw me off a bit. "A huge hunk of creamy vanilla ice cream covered in a thick, chocolatey shell. It’s simple, classic perfection — The best thing to happen to ice cream since, um, the invention of ice cream." I had an original Klondike bar. Just vanilla ice cream, just a plain chocolate shell. The chocolate had a nice snap to it. It was thick enough to taste, but not hard to bite into. The ice cream was soft, sweet, and creamy. I let it melt just a bit, and it got even better. I really enjoyed this, simple as it was. When I visit my family, my mother often makes a wonderful 5 cheese pasta dish that we call "grown up mac and cheese" from a Smitten Kitchen recipe that we have tweaked a bit. And when we grow sick of traditional leftovers, my mother and I both really enjoy waffling it, which, you've read about before. Waffling Transformation: Baked Pasta with Five Cheeses. There isn't much new to this story, as its a repeat of something we have done many times. So the answer to this one is pretty expected - Leftover Baked Pasta with Five Cheeses, Will It Waffle? Yup. The Original: Baked Pasta with Five Cheeses. The original dish this time was slightly different from our previous adventures. It is usually cooked in a cast iron skillet and finished under a broiler, but this time it was served as part of a big Christmas Eve feast, so we couldn't quite do the more fussy preparation. And honestly, I think my mom just forgot about the cast iron skillet. So, this was the same recipe, just, baked in a regular casserole dish. It also had a bit more cheese on top, I think mom was feeling decadent. 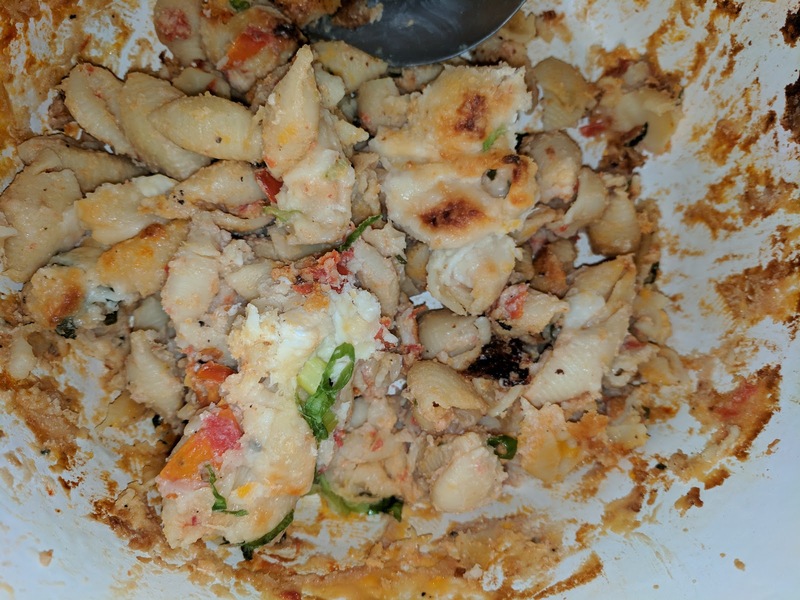 Leftover Baked Pasta with Five Cheeses. The leftovers are always good, but, reheating them results in the oils running out, and cold, it is a bit dry. 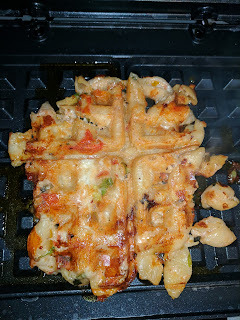 So into the waffle iron we put it, no crusting, 350 degrees, about 5 minutes. 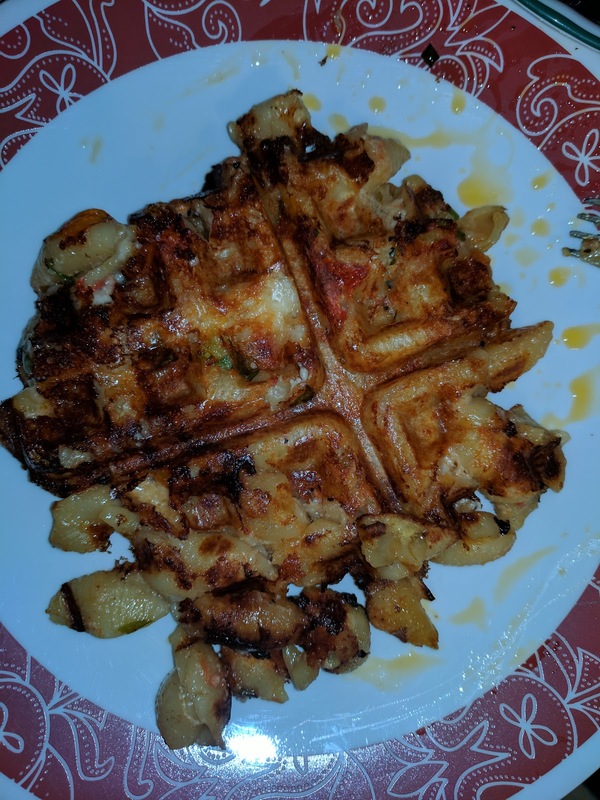 Waffled Baked Pasta with Five Cheeses. It crisped up perfectly, extracted easily ,and was a success as always. Why doesn't everyone waffle their leftover cheesy pasta? Another installment of waffling leftovers, using leftovers I suspected would waffle great: leftover pasta. 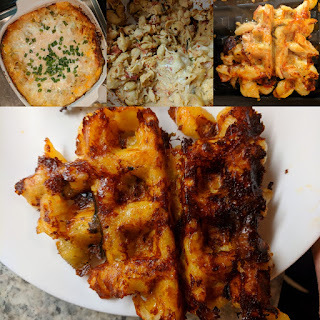 I've waffled many other pasta dishes over the years, like mac and cheese, tuna noodle casserole, lasagna, and even choroizo wrapped pesto pasta, so when I had two-day old pasta that needed life breathed into it, I knew where to turn. My waffle iron. 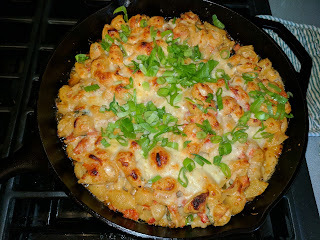 Waffling Transformation: Skillet-Baked Pasta with Five Cheeses. 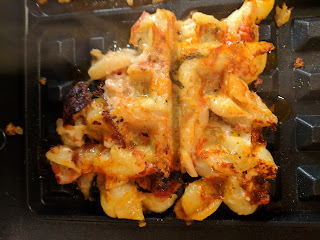 The answer to this one is pretty straightforward - Leftover Skillet-Baked Pasta with Five Cheeses, Will It Waffle? Yup. 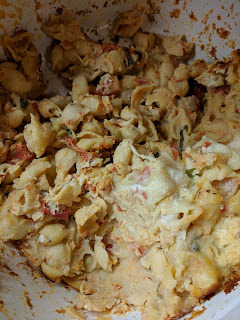 The original was a Smitten Kitchen recipe, pasta shells mixed with 5 cheeses, herbs, and tomatoes, baked in a cast iron skillet, and topped with lots more cheese. 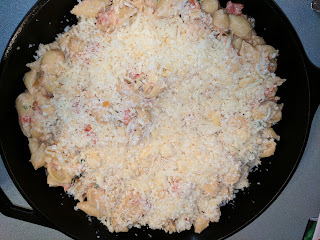 My mom made this a few years ago, and it was a hit with the whole family, so she continues to make it when I visit, tweaking it a bit through the years (we use more herbs, her homemade chunky tomato sauce, a different mix of cheeses). 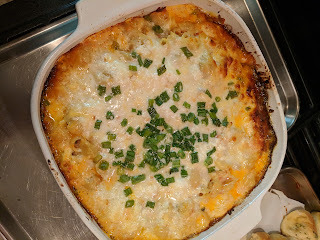 The Original: Skillet-Baked Pasta with Five Cheeses. I always enjoy the original, as the cast iron skillet and broiled top (optional step, but, totally recommended) yield plenty of crispy bits. I'm all about the crispy bits. We add plenty of ricotta for creaminess, and a smoked cheese or two to enhance the flavor, and, well, this dish is a winner. This year, she made a double batch, one in a cast iron skillet (as per the recipe) and one in another baking pan, to compare. It meant we had a LOT of pasta leftover. 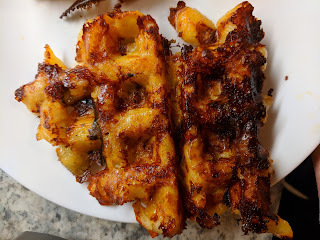 And I knew the waffle iron would help me out with even more crispy bits. We ate leftovers one day, reheated traditionally. It was fine, although, like mac and cheese, some separation occurred, and oils ran out. I also had some cold, which I've enjoyed in the past, a la pasta salad, but, this time it was just a bit too dry. By day three, the waffle iron is where I turned. At my mom's request. She wanted to try it waffled! So into the waffle iron a chunk went, 350°. I let it go a fairly standard amount of time, just under 10 minutes probably. Waffled Skillet-Baked Pasta with Five Cheeses. The pasta waffle was exactly as I expected it to be. Lots of crispy exterior, formed by both the pasta and the cheese. So many little crispy bits. 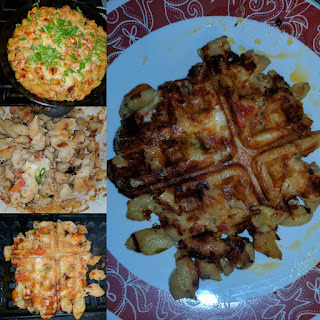 The shells in particular were a fun choice, since they had more interesting contact points with the waffle iron than flat pasta like lasagna does. The cheese didn't run out, which surprised me a bit, but perhaps this mix of cheeses (mostly hard cheeses), just worked better than the softer cheeses used formac and cheese, where I've had this problem a bit? Anyway, it was a fine, crispy pasta waffle, although it did lose the creaminess of the original. My mom enjoyed it topped with steamed collard greens. Poke. Poke bowls. One of the latest fads for sure, and although it has hit San Francisco it isn't too bad, but the same cannot be said for Los Angeles and Seattle. Seriously, everywhere. 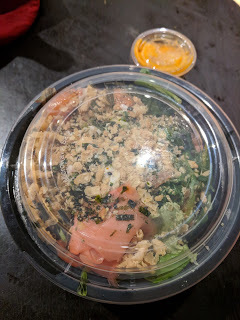 So when I arrived in Bellevue, WA on a Sunday evening and didn't have the energy to go out to a real restaurant, poke it was. I had my choice of at least 3 different poke places all within half a block of my hotel, but I went for MIX Poke Bar, the one with the highest Yelp ratings. MIX Poke Bar is fairly new, open only a year, located in Bellevue Square mall. "MIX Poke Bar puts a modern spin on the traditional Hawaiian dish while respecting the history and culture of where it came from. " 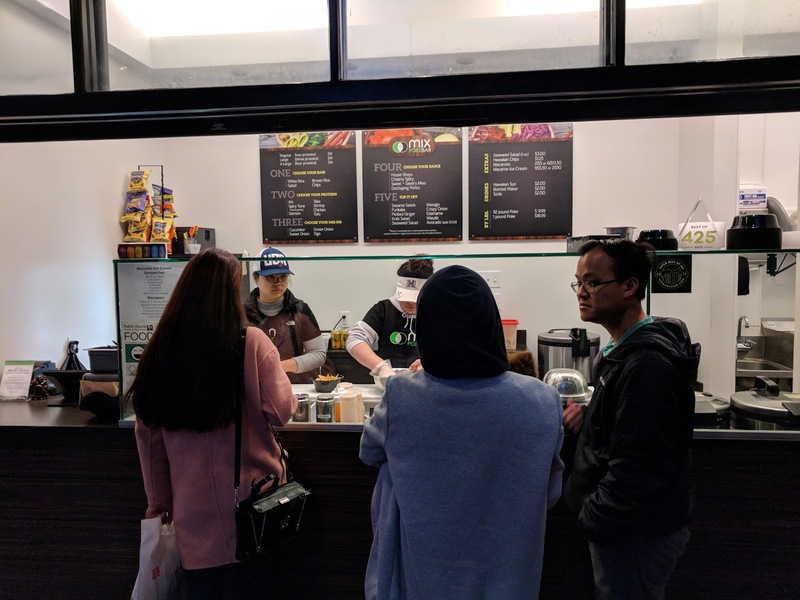 MIX Poke Bar is a very casual place, located on the sidewalk basically next to The Cheesecake Factory outside the Macy's in Bellevue Square mall. They have no seating, and really, it is just a open ordering area to the outside. 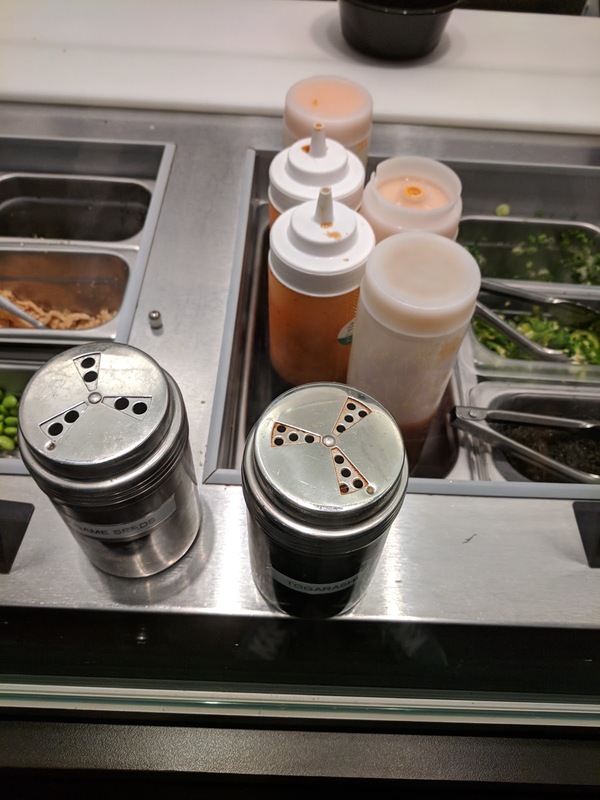 The menu is poke bowls. There are lots of customization, all included in the price, but besides that, the menu contains only bags of chips (Hawaiian chips), soft drinks (Hawaiian Sun), poke by the pound, and macaroons. The first thing you select is the size, ranging from "Regular" with 2 proteins for $12 to "X-Large" with 4 proteins for $16. I'm not sure if the amount of the base changes too, or just the proteins? There is no option for a single protein, but probably you can just select one and double up? The next decision is what your base will be. Salad greens, white rice, brown rice, or tortilla chips. I went for the smallest size since I wasn't actually very hungry, with salad greens as my base, because I don't like rice. I was planning to get the chips actually, but the person before me got chips, and I saw they were just tortilla chips. Somehow I thought they'd be more interesting than that. With your bowl size determined, and the base added to it in, it is time to continue down the assembly line. Next up is your choice of protein. 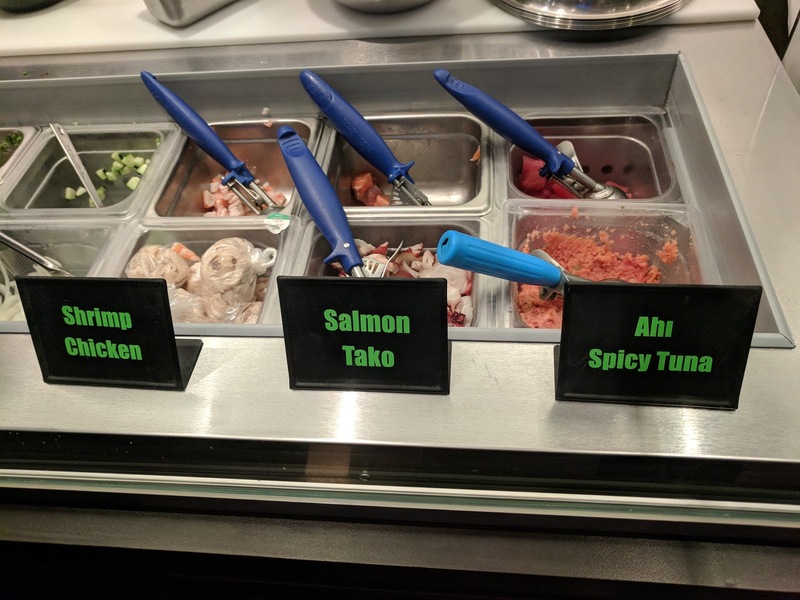 Choices here include standard raw offerings (tuna, salmon), cooked seafood (shrimp, octopus), a non-seafood option (chicken), and vegetarian option (tofu). The only protein I really wanted from this section was the octopus, but I picked salmon as my second since I was required to pick two, and, I figured I could hedge my bets. 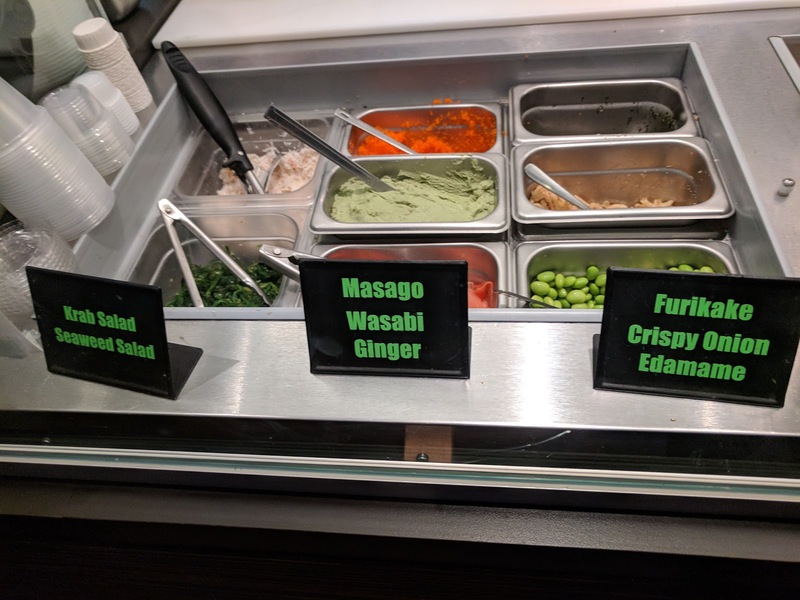 I certainly didn't want chicken or tofu, and I'm just not really into raw seafood these days, but, I do still sometimes like raw salmon, and I was in the Pacific Northwest after all! Your protein is put into a metal bowl for mixing with the mix-ins, not into the container with your base. Next is, well, the mix-ins. 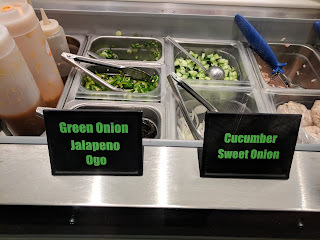 Green onion slivers, slices of sweet white onion, cubes of cucumber, thin slices of jalapeno, and ogo (seaweed). I don't like cucumbers so I skipped that, and was planning to add many things in the next station, so I left out the jalapeno and sweet onion, but added the green onion and ogo since I thought they'd compliment my upcoming selections well. These were added to the bowl with my proteins. The sauce choices all sounded pretty interesting: House Shoyu, Creamy Spicy, Sweet + Savory Miso, Gochujang Ponzu. I narrowed down to creamy spicy (because, um, I love creamy sauces) and sweet + savory miso (because, uh, miso), and asked for a recommendation. I was told that they are both great, and that people love to mix them. I didn't know that was an option! Of course I wanted to mix. The sauces are normally added to the metal mixing bowl with the protein and mix-ins, but I asked to have mine on the side, for two reasons: first, what if I didn't like it! But second, I wasn't planning to eat it right away, and I didn't want it to get mushy. This was no problem, and my sauce mix was made into a little container on the side instead. The person making my bowl recommended that I still add sesame oil to the mix then, which I agreed to. She also offered sesame seeds from the shaker, which I also said yes to. The final station is why I was really there. Honestly, if I could have just gotten toppings, I would have. Krab salad, seaweed salad, masago, wasabi, ginger, furikake, crispy onions, and edamame. I left off the edamame and roe, but went for everything else. So, my final creation: Regular size, mixed green base, tako and salmon proteins mixed with green onion and ono tossed with sesame oil and sesame seeds, topped with krab salad, seaweed salad, ginger, wasabi, furikake, and extra crispy onions, with spicy creamy + sweet and savory miso sauce mix on the side. I think I selected well, although, poke bowls just really aren't for me. I still enjoyed most of it. I'm not a big salad eater, but, the greens were good, a pretty standard mix of "salad greens", that is, baby spinach, a few slightly bitter lettuces, some standard green leaf. All fresh enough, and delicious dunked in the sauce, and tasty where the sesame oil soaked in. The proteins though ... I did not like. At all. The tako I was pretty excited for. I adore octopus, and I've been on an octopus kick lately. But this ... this was every reason people don't like octopus. It was sooo chewy, rubbery. I really couldn't get through it with my teeth. It had no flavor, only chew. I love a nice smoky grilled octopus, but this ... yeah. I tried a few different pieces, different sizes, different parts, hoping something would be salvageable, but alas, no. The salmon I also didn't like, but that I expected a bit more. It wasn't well trimmed, and it was pretty flavorless. Not nearly as offensive as the octopus, but really not good. The sesame oil, green onions, and seaweed that were mixed in though were good, and I enjoyed those elements, particularly as the lettuce below soaked it all up. My toppings though redeemed the whole thing. In the center of my bowl was a scoop of the krab salad. Yes, it was "krab" and I knew it, but I loved it. Bring on the mayo and I'm a happy girl. The seaweed salad was another scoop, added on one side, and it too was good. Better than most generic seaweed salad, a good assortment of seaweeds, great flavors and seasonings. Awesome mixed with the krab salad too. The ginger was a bit comical ... a huge, huge mound, as big as the pile of krab salad if not bigger. Um, I didn't need that much ginger. It was pretty typical low-end pickled ginger. Nice to cleanse the palette I guess, but not particularly good. The wasabi was even funnier, just a big pile of wasabi paste stuck on top of the bowl. Uh ... I guess I was supposed to mix it in? It too seemed pretty low end. I'd probably leave both of these off in the future. The crispy onion bits were awesome. I'm a sucker for these in general, so it probably comes as no surprise that I loved them. I loved the crunch, I loved the fried-ness. I was originally given a little mound, just like all the other elements, in its own separate area, but I asked for extra, saying I just loved crunch so much, and so she sprinkled some all over the top. Yes! Furikake was my final topping, also sprinkled all over the top. It added great flavors to everything. And finally, my sauces, on the side. They were both great. The creamy spicy sauce wasn't really that spicy, but it was quite flavorful, and yup, mayo. I enjoyed dunking salad into it, and would have liked dunking my octopus in, if I had liked the octopus that is. The sweet and savory miso was a lighter option, but again, great flavor. I see why she recommended mixing them. So overall, I did actually end up with a tasty salad that I enjoyed, topped with very flavorful seaweed salad, creamy krab salad, and plenty of crunchy fried onions, with very delicious sauces on the side. It was fairly healthy and quite satisfying, and really packed in a lot of flavors and textures. That said, I discarded the premium parts of my bowl, the salmon and octopus, and that felt a bit sad. I really wish I could just go for some krab salad and seaweed salad sides, topped with crispy onions and furikake!